Australians have a great time at Christmas, exchanging Chrissie pressies with each other, and often enjoy a barbie (not the doll, a barbecue) on December 25th. In Australia we still cling to European Christmas traditions. 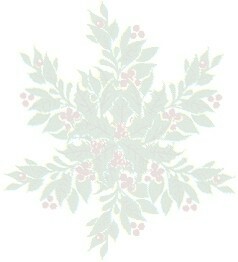 Many Christmas cards feature holly and snow. The trees decorated for Christmas are often exotic pines. Santa may be seen depicted in swimsuits, and arrives at Aussie beaches on a surfboard - quite a change from sliding down a chimney! 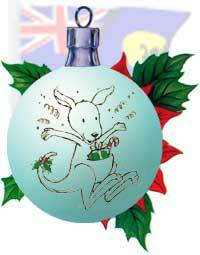 Decorations can include Aussie images like kangaroos and koalas stifling in Santa hats or red scarves! Christmas cards reflect the same extremes from traditional Victorian images to a summer Santa! Our traditions include Carols by Candlelight in the parks and gardens of most cities and towns. 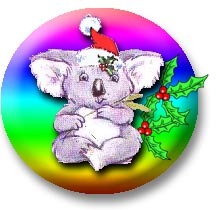 Each year Australia Post issue a series of Christmas postage stamps to facilitate the mailing of Christmas greeting cards to friends, at a reduced postage rate. The Sydney to Hobart Yacht race is an Ocean Racing Blue Water Classic. It starts on Boxing Day in the Australian city of Sydney,. 630 nautical miles later after some notorious rough water and incredible coastline it finishes in Hobart - the capital of Australia's island state, Tasmania. Christmas in Australia is within three days of the longest day of the year therefore we have long daylight hours with warm temperatures instead of short days with long cold nights. Of an evening the sound of children playing outdoors drifts across the suburbs. You can have any type of weather for your Christmas in Australia except a white Christmas. However Christmas 2000 saw a light covering of snow on some of the mountain peaks in the island state of Tasmania. So to have a white Christmas you must climb a mountain and then only about every ten years will you actually have a white Christmas. To each and all of you.